Vatika India Next (INXT) is an endeavour by Vatika Group to bring back life’s harmony, and INXT proffers exactly the same. One of the largest townships, developed in a lavish 700 acres* of land in one of the prime locations in Gurgaon’s sector-82. The township will be home to over 1,00,000 people, who will experience an unsurpassed lifestyle that Gurgaon has never seen before. Vatika India Next is an upcoming residential project in Gurgaon. Vatika has set a new standard in modern living by combining the three axioms of life; to live, work and play, under one roof. Vatika INXT spurs you to take the next big step in life. INXT is Vatika Group’s magnum opus, situated near NH-8 highway in Gurgaon, Haryana. Vatika INXT, a residential development spread across several acres of land is planned meticulously with particular emphasis on the requirements and daily lives of its residents. INXT is a city in itself – with residential and commercial spaces, over 30 educational institutions, medical facilities, clubs, sports arenas, entertainment facilities and lots of open space to enjoy the leisures of life. Everything you and your family may want or desire is right round the corner at Vatika India Next. Vatika India Next has something for everyone; luxurious villas, spacious floors, independent plots and magnificent high-rise and condos, and offers even more. To whet your desire that has been build up to own a space at Vatika INXT, Gurgaon’s most exclusive residential project, lets have a look at what makes it the next big thing in Gurgaon’s residential real estate. Designed for a select elite, Vatika’s Signature Villas comprises of duplex villas and is one of the prime residential projects in Vatika INXT. Situated amidst a beautiful landscaped surrounding of swaying trees and lush lawns, it offers an exclusive lifestyle. A secured gated complex with 42 tastefully appointed exclusive villas with its own lawns in the front and the back with enough parking space for 3 to 4 cars. These villas have a large living space which spreads over two floors and a basement; with servant quarters and space for further expansion on the second floor. A feeling of sophistication and exclusivity pervades the interiors. Signature Villas, imbued with grandiose and surrealism will be a delight to live in, and will also be a wonderful place to entertain friends and family. 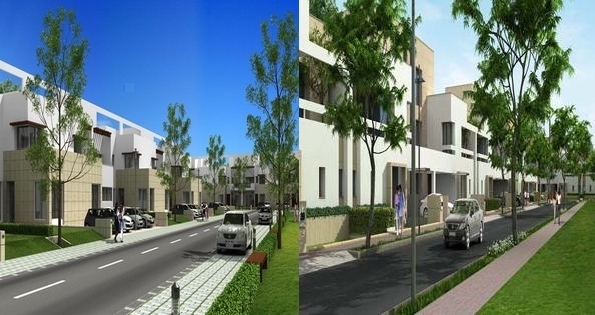 Vatika’s Signature Two villas in sector – 82 Gurgaon represent the apex of luxurious suburban living. Vatika India Next offers this luxurious lifestyle, which is the embodiment of experience, comfort and exclusivity. Signature Two is placed in a beautiful surrounding of landscaped garden and parks with walkways alongside avenues. A secured gated community, it consists of single and duplex villas on plot sizes of approximately 205 sq mtrs and 302 sq mtrs. The interior design of the residential complex complements the beautiful exteriors, which lives up to the upscale lifestyle of the intended residents. Signature Two villas also gives its residents the freedom to build extra floors whenever they choose to do so. Signature Two villas are the most luxurious expression of individualism, and will be the setting for a truly exceptional way of life. Sovereign Residences is an exclusive pocket of 45 villas located in Sector 84 within Vatika India Next, Gurgaon. Vatika INXT will offer a surreal lifestyle that Gurgaon has never experienced before. A small city in itself, it will ensure that its residents gets to indulge in the splendor and beauty that life has to offer. To whet your desire to own a home, Vatika India Next township has something for everyone. We will continue our journey to explore the rest of the Vatika INXT township, the residential complexes and the features in the next blog. So stay tuned to know more about the most awaited and upcoming residential projects in Gurgaon. This entry was posted in Residential Space and tagged residential properties, residential societies, residential township, vatika apartments on January 30, 2014 by Admin.